I came by my love for science fiction honestly. My dad was a part-time sci-fi writer for the first few years of my life and took me to his writer’s club meetings once a week. My parents spent weekends playing Dungeons and Dragons with their group of friends and I was running my own adventures by age 7. In the month prior to my birth, “Star Wars” made its cable debut and my mom, laid up on bed rest, claims to have watched it two dozen times. I didn’t stand a chance; I was born to love sci-fi. I will be the first to admit, however, that good sci-fi has proven hard to come by. For every “Star Wars” there are three “Starship Troopers” (seriously, there are at least three of them); for every “Firefly”, there’s the Friday night movie on the SyFy channel. There is some cheesy, absurd fun to be had with this type of offerings, sure, but no one will argue they’re good movies. It can be hard to defend sci-fi as a whole when non-fans have so much ammunition from which to choose. So when a visionary, smart sci-fi director jumps onto the scene the way Duncan Jones did with 2009’s “Moon,” you can bet I’m touting the guy’s genius as long as he keeps putting out smart sci-fi, which is exactly what “Source Code” is. When Captain Colter Stevens (Jake Gyllenhaal) awakens, he finds himself aboard a commuter train in the company of a beautiful woman named Christina (Michelle Moynahan) whom he doesn’t know but seems to know him. His disorientation is cut short, though, when a bomb goes off, eviscerating everything around him. He wakes up again, however, this time strapped into an odd seat inside of a metal capsule surrounded by electronic equipment. His confusion is only deepened when Goodwin (Vera Farmiga) appears on a monitor and informs him that he is in the Source Code. Through a complicated equation of quantum physics (or mechanics or something that I didn’t really understand because I dropped out of high school) and in-depth neurology, Source Code allows someone else (namely, Captain Stevens) to inhabit the mind and body of a person in his last eight minutes of life. In this case, that person is Sean Fentress, a teacher who died in the train explosion which turned out to be only the lead up to a much bigger terrorist attack on Chicago. It isn’t exactly time travel that he’s been gifted with but rather a glance into the past that could allow him to pinpoint the bomber and therefore prevent future attacks. Bewildered and certain that he isn’t being given all the information about his situation, Stevens undertakes the task at hand with tenacity but takes it upon himself to change not only the future but also the past. 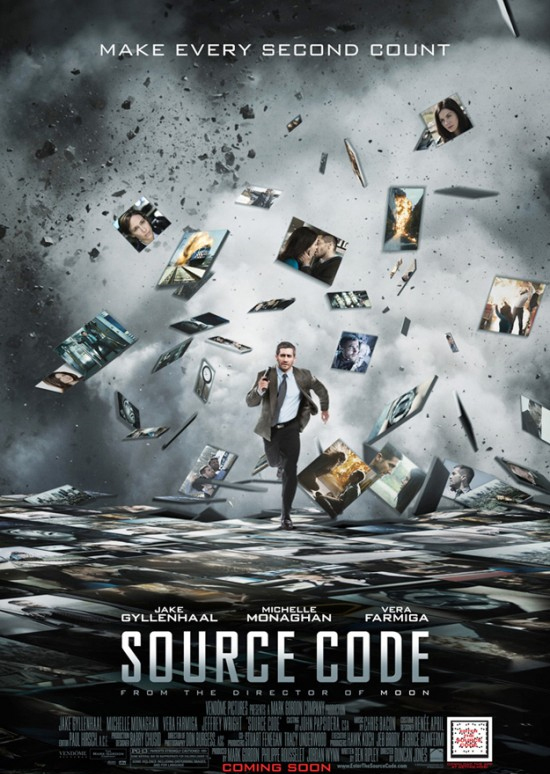 From a sci-fi perspective, “Source Code” isn’t quite to the level of “Moon” which is, for my money, the best true sci-fi film of the last decade (if not more). On the flip side, however, it’s much more across-the-board accessible than its predecessor. Whereas my wife would attempt to destroy our TV if I forced her to watch “Moon”, Sci-fi fans and haters alike should be able to find a great deal worth celebrating here. 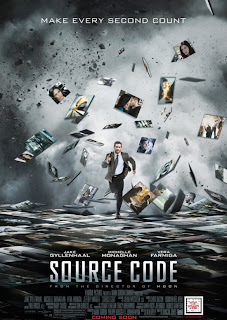 From the casting choices on down to the very layout of the narrative, every aspect of “Source Code” is expertly crafted. Gyllenhaal (whom I’ve never been a fan of) was a stumbling block for me in the beginning but as the film progresses, Stevens proves to be tougher, smarter, and more determined than either his superiors or the audience would have imagined at the outset. His on-screen presence grows as the tension rushes toward its peak which leaves the viewer with a feeling of authenticity. It is a fine performance that could be put up against any of his other roles (though again, I’ve never been much of a fan). The other actors, namely Moynahan, Farmiga, and Jeffrey Wright, aren’t given much opportunity to develop into anything more than Gyllenhaal’s backup band, but each fills their respective role admirably. Meanwhile, Jones and screenwriter Ben Ripley don’t waste a single scene, the starting point for any potentially great film. Each minute, each scene, does nothing but add fuel to the fire of the film’s momentum. Likewise, virtually no time at all is spent on explaining the science of Source Code, nor its origins. We are told what Stevens is experiencing but not how. That’s a brilliant stroke, in my opinion, because it keeps the film from bogging down in convoluted and hypothetical (read: “bull crap”) science that the average Friday night moviegoer isn’t going to understand, anyway (read: “me”). Instead, we are presented with the concept and simply asked to buy in while simultaneously providing such a lively film as to make it almost impossible to remain un-invested. The sheer length of my summary paragraph should give you a hint into just how complicated the concepts behind “Source Code” truly are. But like Christopher Nolan, Jones treats his audience with respect. In that I mean, he accepts that those who sit down to watch his movies are, in fact, capable of following a complex, intelligent plot line and used special effects and explosions as a side dish, not the main course. That is a refreshing attitude in the action movie/sci-fi industry that is overrun by the Michael Bays and Jerry Bruckheimers of the world. Mindless explosions and stereotypical alien invasions can be fun and entertaining but I’m not an idiot and it’s nice to have a filmmaker treat me accordingly without stepping into an art house theater. It also doesn’t hurt Jones’ love for significant science fiction is clearly evident in just about every scene. The combination of traditional sci-fi sentimentalities along with an adult-approved atmosphere, some classic action film elements, and a hint of romance creates an intense and highly enjoyable thrill ride. Care for a second opinion? Check out A Life in Equinox's take, which highlights a small flaw I didn't have room for.